Billy-Bob: he has a high tuft on his head that looks like a slicked-back pompadour, thus his name. He has scoliosis and a slightly uneven gait, but by golly, he's now the lead gander and is taking his job seriously. The New Girls: of the four "new" reared-from-goslings geese, only two have a name, and one of them is Babs. 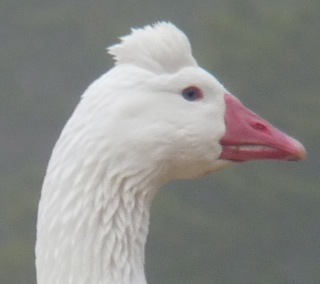 Her profile (and distinctive honk) reminded me of Barbara Streisand, thus the name. Then there's Lola, who has what looks like a black beauty mark (a couple of tiny colored feathers) near her eye. The other two girls don't have much in distinctive personality, just generally crabby & destructive*. 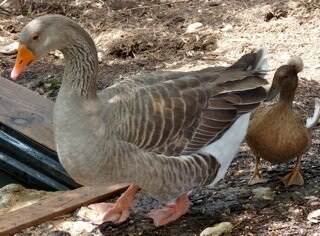 We call them "Generic Geese". The adopted goose, "Purdy" Gertie: new girl boy on the block. (We discovered Gertie was a "he" while he was having a Pool o' Woo session with Lola. Gertie's boy parts became, ah, obvious.) 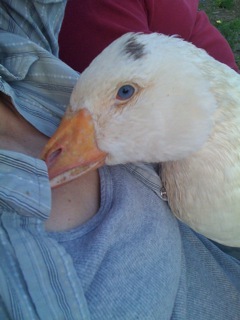 He has a duck buddy named Moe (see Ducks page), and were both rescued from an owner who could no longer care for them. Gertie is a fierce protector of anything small and/or helpless, and will literally body-block any goose that tries to be mean to the small/helpless creature. Gertie has remembered that he's a goose, and has reverted to his genetic crabby roots. Finally figured out he's of the production Toulouse breed, which does not have a dewlap. Trying to figure out his breed had me seriously perplexed for almost a year. *Destructo-geese: our geese like to taste-test everything at least once, ten times is better, even if they don't like the taste of whatever they're chewing. They've destroyed window and door screens, canvas chairs, and most garden plants. They've chewed to ribbons plastic canvas tarps, and cotton porch curtains. They've pulled off rubber trim on car door bottoms. They like to steal sockets from socket wrench kits, and drop rocks into the goose pond. If it can be tugged, pulled or chewed, it WILL be tugged, pulled or chewed. They're also not averse to crapping on everything in their path. They also like dog kibble, and sleeping (and pooing) on the dog beds. The dogs can sleep elsewhere, thankyouverymuch. Miss Cecily: (deceased; see eulogy) A goose with a Very Small Tuft and amazing personality. At only 18 months, she succumbed to Avian Leukosis, which made her underweight, weak, and too stiff to groom herself or sleep properly. For six months we kept her in the house while attempted everything possible to help her heal, not knowing that her condition was incurable (leukosis can only be determined by necropsy). Regardless, she adapted amazingly well to the new environment. She liked to take naps on the human's chests, stand & grunt in front of the refrigerator when she was hungry, and tugged on our hems when we were fixing her 3x-a-day health smoothie. Also known as "Squeezlegoose". 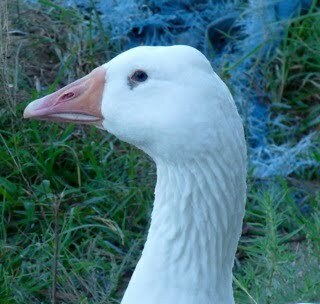 Godzilla (deceased): one of our first batch of hand-raised goslings. He was a sweet, sweet boy, and I still miss him. I plan on having his image painted on the tailgate of the soon-to-be-purchased, new-to-me truck. 'Cause I gotta do my part to keep this town weird, ya know? Queenie: she was raised with Godzilla, then as an adult took an intense disliking to him. We ended up giving her away so poor Godzilla could hang out with the rest of the gaggle. 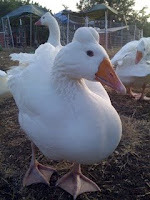 Last I heard, she had spurned the gaggle of geese at the new owner's property, and had instead taken up a friendship with their pot-bellied pig. True story.